Traveling by coach, you'll follow the road that heads north over the island, stopping at the Sta Iria viewpoint to look over the north coast. You'll visit the local tea plantation and factory, and sample some of the better-known Azorean blends. Then, continue to the Pico do Ferro viewpoint with a magnificent outlook over the Furnas Valley. You'll head up to the lake in time to see your lunch being taken out of an earthen oven in the ground, where it has been cooked using natural geo-thermal power. Return to the village to dine on your special lunch: “Cozido das Caldeiras.” Afterwards you will see the Terra Nostra Garden—among the most beautiful gardens in the Azores. This park features a natural hot-water swimming pool. You'll have time for a quick swim if you wish. Visit some hot springs in the village to learn about the different mineral water sources; then return to Ponta Delgada via the south coast,passing by at Vila Franca, which was the island's first capital. Please note: Wear comfortable clothes and walking shoes and bring a camera, hat, ,sunscreen, and local currency if you wish to purchase any goods. Bring your swim suit, towel and flip flops if you wish to swim at Terra Nostra´s pool. The swiming pool´s ferrous water fades bright colors. A swim suit with dark colors is recommended. The facilities include a few changing rooms and two cold water showers. Lace up your boots and grab your sense of adventure, you’ll be heading out on a spectacular journey on foot through the Azores' stunning natural landscapes. After a 30-minute drive across São Miguel island, you'll arrive at Vista do Rei, a breathtaking viewpoint considered one of the seven wonders of Portugal, famous for its magnificent views of the Sete Cidades caldera. Also called the King's View, from here you'll not only be awed by panoramic views of two dazzling alpine lakes, but also begin a 2-hour moderate-level hike at the nearby trailhead. Set out with an expert guide across steep pathways, passing the 3-mile-wide crater and verdant forest environs dappling the island's western coast. Along the way, hear the fascinating geothermal and geographical history of the region while identifying native flora and fauna. The trek will conclude at the quaint village of Sete Cidades on the western edge of the lake, where you'll enjoy some time to cool down before being transported back to the port. Please note: Wear comfortable outdoor clothes and hiking footwear ( dress in layers and bring a rain protection), a hat and sunscreen, water and energy bar, camera, and local currency if you wish to purchase any goods. Enjoy an off-road adventure in 4x4 vehicles as you take in the Azores, crossing small streams far from the daily hustle and bustle of the city, as your journey takes you into the mountains. Trees indigenous to the area, hydrangeas and other varieties of vegetation cover the soft edges of the valleys—a serene setting of sparkling waters and small villages. This whole area feels as if it is lost in time and is a region of vast farmland—the breadbasket of the Azores—which provides food and wealth for the population of the islands. Interestingly, modern technology often takes a back seat here as the land is worked according to age-old tradition. Please note: Wear comfortable clothes and walking shoes and bring a camera, hat, ,sunscreen, and local currency if you wish to purchase any goods. The order of the itinerary is subject to change for operational reasons, to respect opening hours of the visited locations or to avoid overcrowding in areas with limited capacity; visibility at the viewpoints depends on the weather conditions. This tour is not recommended for children under 8 years old, pregnant guests or guests with back, neck or joint problems. You will depart from the pier for a scenic drive towards Barrosa, up the mountain road to see the views over Fogo lake. A nature reserve since 1974, this crater lake reaches a maximum depth of 98 feet (30 meters) and it is the highest point above sea level on the island. Continue down, descending to the north coast and stop to visit Caldeira Velha. Classified as a Natural Monument it displays some interesting flora diversity as well as a small waterfall and a hot water swimming pool. In Ribeira Grande, the chromatic game increases between white masonry and basalt and ignimbrite stonework. This contrast is visible in churches, such as the Nossa Senhora da Estrela Church, with a monumental staircase and a singular black bell tower. Other interesting features are the Oito Arcos Bridge and the iron balconies of manor houses. After a short walking visit to this charming town proceed to a local farm which among other things breeds Lusitano horses, known for their bravery, intelligence and willing spirit. After a visit to the stable and before returning to the pier you will relax and get acquainted with the local flavors at a wine & cheese tasting. Please note: Wear comfortable clothes and walking shoes and bring a camera, hat, ,sunscreen, and local currency if you wish to purchase any goods. Discover one of the seven natural wonders of Portugal. From Ponta Delgada you will head to Fajã de Baixo to visit a pineapple plantation where the fruit grows in hothouses. See the different phases of the pineapple's growing cycle and taste a sample of pineapple liqueur, juice or fruit (subject to the supplier´s availability), with time for souvenir shopping afterwards. Continue along the mountain road, descending into the village of Sete Cidades, named for the volcano towering above. You'll have free time for a quick coffee (not included) or to stretch your legs before you continue to the Santiago Lake and Vista do Rei viewpoints. You will reach the main crater of this extinct volcano at an elevation of 1,900 feet above sea level. From the edge of the crater, eight miles in circumference, take in the magnificent view of the "twin" lakes at the bottom. One is blue, reflecting the sky, and the other is bright green, reflecting its beautiful setting within the crater walls. Return to Ponta Delgada upon completion of your tour. Explore at your own pace with a private vehicle, driver and English-speaking guide at your service. You will have the flexibility and independence to design your itinerary ashore according to your own interests. On this full day option you can combine an itinerary in Lisbon only or choose its charming surroundings as Sintra, Cascais, Guincho or Cabo da Roca. Please note: Capacity: 1-2 guests. Private cars are ordered per vehicle (not per person).This tour includes transport in a private car, driver and English Speaking Guide. Itinerary in Lisbon, Sintra, Cascais, Guincho or Cabo da Roca areas and for 8 hours duration. Please note: Capacity: 3 - 6 guests. Private vans are ordered per vehicle (not per person).This tour includes transport in a private van, driver and English Speaking Guide. Itinerary in Lisbon, Sintra, Cascais, Guincho or Cabo da Roca areas and for 8 hours duration. Explore at your own pace with a private vehicle, driver and English-speaking guide at your service. You will have the flexibility and independence to design your itinerary according to your own interests. On this half day option you can choose an itinerary in Lisbon city. You can choose from exploring the typical quarter of Alfama and Castle St. Georges, the majesty of Avenida da Liberdade, a charming old boulevard place of several international stores (such as Prada or Armani) lined with gardens; Jerónimos Monastery (closed on Mondays) considered being the jewel of Manueline art; the President’s House, Belém Tower, Monument to the Discoveries among many others. Please note: Capacity: 1-2 guests. Private cars are ordered per vehicle (not per person). This tour includes transport in a private car, driver and English Speaking Guide. Itinerary can be adjusted with tour guide as long as it’s in the Lisbon area and does not exceed the duration of 4 hours. Recommended for physically challenged guests. Please note: Capacity: 3 - 6 guests. Private vans are ordered per vehicle (not per person). This tour includes transport in a private van, driver and English Speaking Guide. Itinerary can be adjusted with tour guide as long as it’s in the Lisbon area and does not exceed the duration of 4 hours. Recommended for physically challenged guests. Lisbon is a city of contrasts, where modern trends merge with ancient ones, accentuating Lisbon’s variety and intensity of color. Your sightseeing tour will pass by Commerce Square thought by many to be the most beautiful in Europe. Enjoy a short walk along the pedestrian area of Augusta Street that connects the Commerce Square to Rossio with some free time at your leisure. You will continue along Liberty Avenue a charming old boulevard place of several international stores (such as Prada or Armani) lined with gardens and known for its unique black and white mosaics on the sidewalks on the way to Marquês de Pombal Square. Take a photostop at Edward VII’s. The highlight of your visit is the church of the Jeronimos Monastery, a masterpiece of Manueline architecture, widely acknowledged to be the finest sight in Lisbon, built in the 16th century. Nearby, you will see the lavishly decorated Belem Tower, and the Monument to the Discoveries, built to celebrate the 500th anniversary of the death of Prince Henry the Navigator. On the way to the airport, you will see, stretching across the Tagus River, the April 25th Bridge, sister to the Golden Gate, and the towering Christ the King statue on the far side. Please note: This tour is only for guests who have a flight later than 2:00 p.m. or an overnight stay in Lisbon. This tour includes transport in a private bus and a qualified English-speaking guide. We recommend respectful clothes when visiting religious sites. Visit to the Jeronimos Monastery Church is conditional due to religious ceremonies that may happen without prior notice. On Sunday mornings Jeronimos Monastery Church is closed to visitors. There will be an exterior visit and a photostop at Belem Tower. On Mondays, when Jerónimos Monastery is closed there will be an exterior visit only as well as a photostop at Belem Tower. Tour order may vary but all sites will be covered. During the visit to Jeronimos Monastery Church headsets will be used. Your motor coach and English-speaking guide will take you via the beautiful coastal road bordering the River Tagus, driving through the fashionable resort of Estoril - the home of several international royal exiles during the Second World War – to the lively scenic village of Cascais. Here you will have some time to wonder around its plaza and enjoy its colorful setting of seaside café terraces, small shops, and sailboats. For six centuries Sintra was the favorite summer residence of the kings of Portugal, who were attracted by the cool climate and the lush beauty of the town’s setting. Writers and poets in general – Lord Byron, Alfred Tennyson, Hans Christian Andersen, and Isaac Bashevis Singer chose Sintra as a preferred destination. The tall conical chimneys of the National Palace and the fabulous Pena Palace, are two unmistakable landmarks of this area. You will have the opportunity to taste local pastry in one of the cafés in Sintra before free time to explore this town recognized as a UNESCO World Heritage Site since 1995. Return back to your Windstar Hotel in Lisbon. Please note: Tour order may vary but all sites will be covered. You will board your minivan quayside for the short ride to the Cable Car Base Station. Your cable car will take you to the Top Station perched on the summit of “The Rock,” for a breathtaking view as you are suspended in mid-air. At the Top Station your guide will show you around the geography of this British colony. Then you will travel to the Middle Station and the sanctuary of Gibraltar’s old inhabitants, the Barbary Apes, roaming free around this station. Reboard your coach for a 5-minute drive to Princess Caroline’s Battery and the entrance to the Great Siege Tunnels, a system of tunnels carved out of solid limestone. Proceed to the Gibraltar Museum with its enormous amount of artifacts on display. You will have the option to return to your yacht or stay in town and make your own arrangements for returning to the yacht. Please note: The Barbary Apes are wild animals. Please do not attempt to touch or feed them and hang on to your possessions. This tour is not wheelchair accessible. You will board your minivan quayside and travel past the American War Memorial and the headquarters of the remaining British Naval forces in Gibraltar as you head toward Europa Point.Here you will have a photo opportunity of the beautiful Straits and the Bay of Gibralter, the Spanish mainland and the African continent. You will proceed to the Upper Rock area to visit St. Michael’s Cave and the famous Barbary Apes. You will drive past the Moorish Castle and the Tower of Homage to enter the Upper Town area’s narrow streets. Guests wishing to stay in town and do some duty-free shopping are welcome to return to the ship on their own. Please note: Wear comfortable walking shoes. Guests with walking difficulties can take this tour. At St. Michael’s Cave they can exit and enter through the cave entrance rather than take the 75 steps to exit.The Rock Apes are wild animals. Please do not attempt to touch or feed them and hang on to your possessions. Gibraltar is best appreciated on foot. In the company of your knowledgeable guide, you will learn about the natural wonders, flora, fauna, splendid views, and military fortifications Gibraltar has to offer. You will take a panoramic cable car ride to the top of The Rock where you will walk along a wooded path to admire St. Michael’s Cave. Then board a minibus for a ride to the Barbary Apes’ den and the Great Siege Tunnels. You will pass the Moorish Castle and enter the heart of the city where you can either return to the ship or stay in town and shop, returning to the yacht on your own. Please note: Wear comfortable walking shoes. This tour is not wheelchair accessible.The Barbary Apes are wild animals. Please do not attempt to touch or feed them and hang on to your possessions. Moorish-influenced Seville lies in the heart of Andalusia, on the Guadalquivir River Plain. Become acquainted with one of Spain’s greatest and most beautiful cities. Travel by motor coach 1¾ hours north to Seville, which features many architectural highlights, including the cathedral, Reales Alcázares and Casa de Pilatos. After a 1-hour visit to the cathedral, you will stroll through the old Jewish area, known as the Santa Cruz Quarter. Artisans’ shops and quaint cafés occupy whitewashed houses crowded along meandering alleys and charming squares. Following time for lunch on your own, you will take in a panoramic overview of Seville seeing such landmark monuments as the Torre del Oro and La Giralda Tower before taking a refreshing stop at the Plaza de España. Pause to admire this impressive square, which is crossed by a canal, before rejoining your motor coach for the 1¾-hour return drive to the ship. Please note: Comfortable walking shoes are recommended as participants must walk approximately 1½ - 2 miles over both even and cobblestone surfaces. Up to 25 steps must be negotiated. The actual order of attractions visited may vary. Flash photography is not permitted in the Cathedral. Camera and video fees are applicable for the upper floors of Pilatos House and the Cathedral. Conservative dress (no shorts or bare shoulders), is required inside the Cathedral. Cádiz is the Iberian Peninsula’s oldest continuously inhabited city and lies on a narrow spit of land, surrounded by the Mediterranean Sea. Your guided stroll begins at Plaza de España, near the port. In common with most other Cádiz squares, the nearby Plaza de la Mina was formerly a large vegetable garden belonging to the San Francisco Convent. You will pass the Museum, and stroll on to Calle Ancha (Wide Street), where you will see several handsome 19th century palaces. Nearby, San Juan de Dios Square is protected by seawalls and features a unique marble fountain. But perhaps the Town Hall is the building that best reflects the grace and style of the city. After a 40-minute visit to the interior of the impressive Cádiz Cathedral, you have the option to either walk back to the ship or remain in town to continue exploring at your leisure. Please note: Comfortable walking shoes are recommended as there are uneven surfaces, cobblestones and steps. Conservative dress (no shorts or bare shoulders), is required inside the Cathedral. Discover the secrets of the famous sherry land of the province of Cádiz, which produces the world renowned Jerez wine. Your tour will start with a drive to Jerez de la Frontera, a town only 30 miles from the sea and the city of Cádiz. The landscape you will see changes from the dry coastal plain to the fertile land near Jerez. The milder climate makes it possible to cultivate the grapes that produce the three main varieties of sherry. Jerez de la Frontera dates from Phoenician times, but first rose to prominence under the Moors, who called it Xerix or Sherrich "De la Frontera." The 19th century was a period of economic prosperity for Jerez, thanks to a partnership with English exporters and wine merchants launching the success story that the Jerez industry is today.You will visit famous local wine cellars where the time-honored blending process that is responsible for the quality sherry wines will be explained during your guided tour. Afterwards, a tasting of 2 different types of sherry “fino” and “oloroso” will be offered. Please note: Comfortable walking shoes are recommended as there are uneven surfaces, cobblestones and steps. You will start your tour with a drive to Jerez City and proceed to visit a Vineyard, Virey Laserna Palace and Fundador sherry cellars. Your tour will start with a private visit to the Vineyard in Finca El Majuelo, located in Jerez de la Frontera, a town only 30 miles from the sea and the city of Cádiz. The landscape you will see changes from the dry coastal plain to the fertile land near Jerez. The milder climate makes it possible to cultivate the grapes that produce the three main varieties of sherry. You will visit Virey Laserna Palace, located in the heart of the historic center of the city, also known as the Palace of the Conde de los Andes. The beautiful architectural design of the Palace has a neoclassical style reminiscent of an earlier period with a garden and exquisite decorations inside. You will visit a famous local wine cellar where the time-honored blending process that is responsible for the quality sherry wines will be explained during your guided tour. Afterwards, a tasting of 3 different types of sherry will be offered. Those of you who delight in ancient history and art lovers cannot miss this tour! With half a million inhabitants, Málaga is located in the center of the Costa del Sol. From the outside you will admire the beautiful architecture of the Alcazaba Fortress, a historic castle built in the 11th century to be the residence of the Arabian Caliphs or Kings. It is connected by a step path to Gibralfaro Castle, an ancient Moorish fortress with breathtaking views of the city and its bay. Buses will take you to the castle so you won’t have to walk up the hill. The Museo Picasso Málaga is run by the Fundación Museo Picasso de Málaga and the Fundación Paul, Christine y Bernard Ruiz-Picasso. The Fundación Paul, Christine y Bernard Ruiz-Picasso is the rightful owner of the collection there, whereas the Fundación Museo Picasso de Málaga owns the group of buildings that holds it. As was initially agreed by the donors, the two foundations are responsible for the conservation, exhibition, study and diffusion of the collection. At the museum, you will be able to appreciate all Picasso styles and techniques (Painting, drawing, sculpture, ceramic and graphic works in an exhibition with 155 works ranging from 1890 up to 1973. Please note: This tour involves more than 2 hours of walking over uneven and cobblestone surfaces and steps are involved. Wear comfortable walking shoes. Some things are just plain fun and riding a Segway around Spain definitely falls into that category. It takes a few minutes to get the hang of it; then you'll never want to get off! You'll begin your ride (after an introduction to the operation of the Segway) at Plaza de la Marina, in the center of Málaga. Continue to Larios Street, the main shopping avenue of the city, then on to Merced Square, at the end of Calle Alcazabilla, to see the obelisk erected as a tribute to General Torrijos, currently the headquarters of the Picasso Foundation. Next you will ride to the Santiago Church, built on the site of a former mosque and Málaga's oldest church (founded in 1490). You’ll also visit the Roman Theatre, discovered in 1951, which was built in the time of Caesar Augustus and used until the 3rd century A.D. After that time, it was used as a quarry by the Moors to restore the Alcazaba, which is the next stop on your tour. This impressive building, constructed mainly in the 11th century, was the palace/fortress of the ruling Muslims. Continuing on your tour, you’ll see the Catedral de la Encarnacion, Bishop Square, and the Paseo del Parque, before returning to Marina Square. Please note: This tour is not possible for people confined to wheelchairs. The minimum age to participate is 10 and participants must weigh between 66 and 265 pounds. Helmets will be provided. Participants must sign a waiver to go on this excursion. Peek behind the scenes at traditional Spanish country life as you travel to picturesque Mijas. The “real” Andalusian landscape unfolds en route to this classical village with a strong Andalusian flavor and incredible views over the coast from its hilltop location. All the houses in Mijas are whitewashed and the pattern of the beautiful streets was planned to protect the houses and their inhabitants from the wind. “Donkey-taxis” are plentiful here and beautifully made local handicrafts will undoubtedly catch your eye. You will have time to take a donkey ride or shop for ceramics, handmade wood items and other local souvenirs. As well, you’ll visit the Museo de Vino (Wine Museum) and enjoy tasting some of the fabulous wines of the region as well as a sampling of local meats and cheeses. If time permits, you will enjoy a brief panoramic tour past the highlights of Málaga en route back to the ship. Please note: Spanish law requires motor coach passengers to wear their seatbelts in vehicles that are so equipped. Ancient civilizations have come and gone in the city of Almeria, once an Arab stronghold. Your tour of the city will be on foot, as motor coaches are not permitted in the Old Town. You will begin your tour on the Paseo de Almeria, the most central street of the city. You will enjoy a tapas tasting before visiting the Alcazaba Palace of the Moorish Kings, which houses collections of Phoenician, Roman, and Moorish artifacts. Your next stop will be at the Cathedral, a lovely Gothic building with Renaissance facades, constructed with an incompatible dual purpose – a place of worship and a bastion of defense against Berber pirates. Other points of interest you will see along your walk are the 17th century Convent of Las Puras, the Episcopal Palace, the Cervantes Theater, and the Mercantile Center. You will have free time for shopping at the end of the walking tour. Please note: This tour is not recommended for guests who have difficulty walking or climbing. It involves 3 hours of walking over uneven surface, cobblestones, hilly, and narrow streets. The Cathedral is closed on Sundays so no inside tour is available. The Alcazaba Palace is closed on Mondays. The Astronomical Observatory of Calar Alto is the largest in continental Europe. The team of Azimuth is formed by professional astrophysicists and astronomers and it is dedicated to carrying out - in tight collaboration with the Observatory of Calar Alto and other scientific institutions of international reference - science outreachs from the most iconic spaces related to astronomy, the astronomical observatories, from where every day knowledge of the Universe is expanded. You will take a guided tour through the night sky so that you can see with your own eyes the always impressive planets of our solar system, the delicate planetary nebulae, the globular clusters with millions of stars in the shape of a bee-swarm or the light from other galaxies distant from us millions of light years. Your visit will begin with an introductory talk on the premises of the observatory, to learn about the research in astrophysics done from Calar Alto, followed by a tour which will consist of an instructive lecture about the observatory, the scientific use of telescopes in astronomy, followed by the visit to the building of one of the telescopes. The telescope to visit depends on the availability due to scientific and maintenance tasks. And usually the first choice will be the 3.5-meter telescope. You will continue with a guided visit to “Las Menas” village, famous by the exploitation of mineral deposits, situated around where the Observatory is located. You will visit the interpretation center geo-mining and forest park. Please note: Bring your camera and wear comfortable walking shoes. Among with the rest of the team, someone like Javier Sánchez - Azimuth Projects Director - academically trained in astronomy and planetary sciences will accompany you on the guided tour . 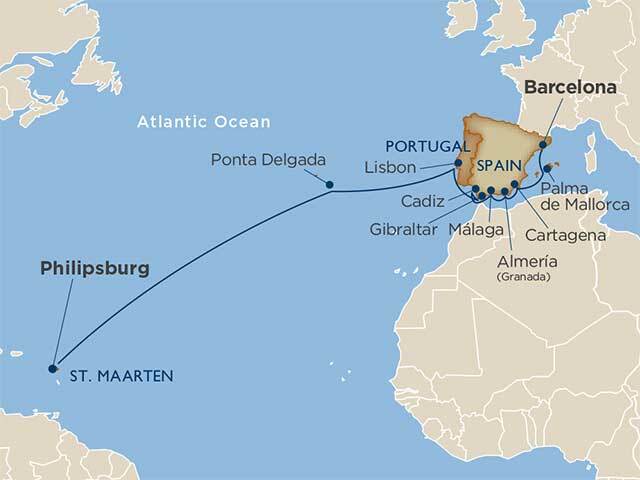 Special shore excursion note: If you are interested in going to the Alhambra we suggest you book your tour in advance by contacting a Windstar Vacation Planner at 800-258-7245. There are a limited number of tickets available and only a 7-day cancellation policy. It is possible once you are on board that this tour will be full and Alhambra entrance tickets will no longer be available. Discover the magnificent Moorish palace of the Alhambra – the dramatic highlight of historic Granada – on this unforgettable tour. A number of interesting sights will be visible from your coach along the 2½-hour drive each way, and your guide will introduce you to local traditions and history as you travel. The city of Granada is truly beautiful, and nothing in all of Spain compares to the wealth of architectural art to be found in the city’s Muslim-Hispanic complex – the 14th century Alhambra, where you will be met by another guide. This breathtaking example of Muslim architecture is surrounded by walls and towers and inside, palaces, military buildings, a fortress and an administrative center. Explore this remarkable structure, with its detailed mosaics, prism-style cupolas and stone-cast latticework offering a surprising grace and sophistication. The nearby Generalife Gardens surround this residence of kings and caliphs. An additional delight is the opportunity to experience a traditional Spanish-style lunch at Ruta Del Veleta restaurant. Typical lunches are 1.5 hours long and include appetizers, salad, a main course, Spanish wine, and dessert. Please note: It is a 2.5-hour motor coach drive each way to Granada. This tour is not recommended for those with mobility issues and there will be walking up and down steps and over uneven, sometimes dirt, and cobblestone pathways. Comfortable walking shoes are recommended. Due to the Alhambra’s popularity and their strict reservation policy it may be necessary to move the departure for this tour to the port of Malaga instead of the port of Almeria based on the number of maximum bookings granted. When this change becomes necessary bookings will be adjusted automatically, you will be notified and you will still go on this tour, but just out of Malaga. Picturesque Mojacar is a sunny mountain village that still retains the traditional whitewashed walls of yesteryear. Your round-trip journey to this lofty settlement features travel along two completely different routes, past ever-changing countryside and striking coastal views. You will pass through mountainous landscapes and the golden Tabernas Desert to arrive at Mojacar, with its flat-roofed houses and whitewashed walls crowd together, perched high above the Mediterranean. Your 2-hour stay provides you with ample opportunity to wander the maze of winding streets, browse through the inviting shops, visit the fortified church, and to revel in the splendid views. Your return journey is through the Sierra Cabrera Natural Park, a UNESCO Biosphere Reserve. Please note: It is a 1.5 hour motor coach drive each way to Mojacar. Comfortable walking shoes are recommended. This excursion is not recommended for guests who have walking or climbing difficulties. The sightseeing involves around two hours on foot, over uneven surfaces and cobblestones with many hilly and narrow streets. There are steep steps from the village entrance to the main square. Spanish law requires that motor coach guests wear their seatbelts at all times while in vehicles that are so equipped. Depart from your pier and travel via motor coach to arrive at Alhabia, situated beside the riverbed of the Andarax River. You will observe the creation of colorful traditional hand-painted ceramics at the hands of the talented owner and his son who has been creating these beautiful works of art for 60 years. There will be free time to browse the studio for traditional Spanish ceramics to take home and share with your family and friends. You will then travel past orange groves and olive trees, vineyards of Almeria grapes, and typical whitewashed villages into the valley of the Andarax. You will pass the Tabernas Desert, the only true semi-desert in Europe and see where many spaghetti westerns have been filmed. You will stop at the family-owned Bodegas Valle de Laujar Winery to taste the award-winning local wines of Almeria along with appetizers of cheese, nuts and the famed jamon. Enjoy the impressive scenery of the Sierra Nevada peaks as you travel back to your waiting yacht. You will pass the Sea of Plastic, Europe’s main vegetable producing area, spreading across 135 square miles. Please note: There will be some winding roads on this tour and the maximum altitude is 3,280 feet. This tour is not wheelchair accessible. Comfortable walking shoes are recommended. Take a tour through Cartagena on a Segway, a comfortable and easy-to-ride vehicle. You will depart from the pier and walk to the training area where you will receive operating instructions. You’ll start your 90-minute Segway ride along the Maritime Promenade, past Carlos III Wall, the panoramic views from the Concepcion Castle and along the waterfront, stopping along the way for photo opportunities. Cartagena is full of interesting history, ancient and recent and on the Segway you'll have the opportunity to see an overview of this amazing city, It´s a clever and alternative tour that will allow you to go farther than walking, you will avoid fuel expenses and parking issues, and support the preservation of the environment. Please note: You must be at least 14 years of age and no more than 260 pounds to operate a Segway . This tour is not recommended for people with reduced mobility or who are disabled. You will be required to sign a waiver to participate on this excursion. Wear comfortable shoes and clothes. Discover a cultural legacy spanning more than 3,000 years as you explore the sights of Cartagena accompanied by an experienced guide. Visit the impressive Roman Theatre and its Museum, whose discovery and excavation provided valuable archaeological insight into the important role of Cartagena in Old Spain’s (Hispania Antigua) history. Your next stop is the Maritime Wall, from where you will see magnificent harbor views as you stroll toward Town Hall Square and the city’s main avenue. Your walking tour will show you the impressive late 19th century modernist architecture. Before returning to the yacht, you will take a 30-minute visit to the archaeological site of Muralla Punica and discover the surviving remnants of the old Punic Wall that once protected the city during the Cartagines’ occupation. A short 15-minute drive will return you to the yacht. Please note: Comfortable shoes are recommended as participants walk for approximately 3 hours. One of Cartagena’s greatest treasures is its tasteful and colorful cuisine. You will enjoy a leisurely walk along the city’s seafront with your guide as you head towards the historical Old Town, where you will view some of Cartagena’s most famous sights, including the Palace Hall, Maritime Wall and impressive modernist buildings. Along the way you will stop at five local tapas bars, where each chef will have prepared traditional tapas of the day (tapas may include Albondigas, Spanish omelet, local cheeses or cured ham for you to sample), accompanied by a glass of sangria, wine or soft drink. Your final stop on the tour will be the recently restored Roman Theatre of Carthago Nova, where you will have some time inside for taking photos, before walking back to your ship. Please note: Wear comfortable clothing and walking shoes. Approximately 2 hours of walking is required so this tour is not recommended for those with mobility issues or wheelchairs. Also note that Spanish law does not allow children under age of 18 to consume alcoholic drinks. Wine enthusiasts this is the perfect tour for you! This tour will combine an exclusive cultural and Spanish wine experience, in one of the most historical buildings in Cartagena, its private Casino where you will have to chance to discover Jumilla flavors. Enjoy the city in a panoramic stroll through the streets of the city center with a professional guide who will show and explain to you the main monuments and archaeological sites. Afterwards, you will have the opportunity to visit Cartagena’s Casino, an incredible modernist private club built during the 19th century. Finally, at this incredible location you will taste local wines during the wine tasting, which includes 4 different Jumilla D.O. internationally acclaimed wines from 2 relevant wineries. You will have the opportunity to buy some wine before leaving. Please note: Wear comfortable walking shoes and bring your camera. You are invited to enjoy a superb sightseeing tour in the charming province of Murcia. Departing from Cartagena by motor coach you will journey for one hour through the foothills of the Sierra de Carrascoy. Your destination is the capital of the province – Murcia. Settled by the Moors in the 9th century and conquered by the Christians in the 13th century, this bustling city offers a wonderful array of architectural delights. Your first stop will be the Monastery of the Virgin of Fuensanta (the Patroness of Murcia). Enjoy a panoramic view of the Murcian orchards, producers of the most fruits and vegetables in all of the Mediterranean. Then travel on for an external visit at the Murcia Cathedral, a medley of Gothic, Baroque and Renaissance architecture. The old building of the Casino of Murcia is your next stop and you will have some free time to stroll the streets, relax in a café and people watch, or browse in one of the many local shops before heading back to your ship. Please note: There are 3 steps to get in the Casino and 3 more in each room inside with tiles on the floor. There is a ramp in the monastery and most of the walking is on flat surfaces. Comfortable walking shoes are recommended. Just a few kilometres from the Port of Cartagena, this beautiful hacienda will delight you with the magnificent steeds of the ranch, pure Spanish-bred horses with fine bloodlines and a graceful appearance. These carefully bred horses are sent to horse lovers all over the world. Looking and even touching the broodmares, seeing the foals and new babies, watching the impressive stampede show, the Spanish Horse Training and the art of managing stallions are some of the things you will enjoy during the visit to the ranch. But just before returning to the pier, and while tasting some of the local products crafted in the area ( tapas, wine and olive oil production) you will be treated with an Andalusian dancer and a stallion performance. Please note: Wear flat sensible old shoes or wellingtons, due to it being a working ranch with animals, rough uneven ground with grass and gravel and some muddy parts. Bring a sunhat and sunscreen and wear weather-appropriate clothing, as the activity is celebrated open air. Palma is the capital of the Balearic Islands and lies on the southeastern coast of Palma de Mallorca Island. A wealth of architectural highlights awaits you. Board your coach and travel to your first stop at the circle-shaped 14th century Bellver Castle, one of the world’s very few rounded castles and the only one of its type in Europe. Built in military-influenced Gothic style, it lies atop a hill affording expansive panoramic views over the city and surrounding countryside. You will travel on to the handsome 13th century La Seu Cathedral, which presides over the city and is one of Europe’s finest examples of pure ecclesiastic Gothic architecture. After exploring the Cathedral’s interior you will view the exterior of the adjacent Almudaina Palace. This austere palace was originally an Arab fortress and later the palace of Majorcan kings. Before returning to the yacht you will stop to see the unique style and architectural engineering of the city’s famous bullring. Please note: Comfortable shoes with rubber soles are recommended. There are approximately 100 steps from the coach parking area to the La Seu Cathedral. Spanish law requires that motor coach guest’s wear their seat belts at all times while in vehicles that are so equipped. On Sundays and holidays the Cathedral is not open to visitors. The history of the Cathedral will be given outside. When visiting the Cathedral, knees and shoulders must be covered. Bellver Castle is closed on Mondays and the visit will be from the outside only. Explore at your leisure with a private vehicle, driver, and English-speaking guide. This exclusive tour will allow you to customize your time ashore and explore the most interesting sites in the comfort and privacy of your own car. With your private vehicle, and the personalized attention of your driver and English-speaking guide, you will have the flexibility and independence to design your itinerary ashore. See the iconic sites of Palma, or create your own personal stops to make the experience your own. Explore at your leisure with a private vehicle, driver, and English-speaking guide. This exclusive tour will allow you to customize your time ashore and explore the most interesting sites in the comfort and privacy of your own van. With your private vehicle, and the personalized attention of your driver and English-speaking guide, you will have the flexibility and independence to design your itinerary ashore. See the iconic sites of Palma, or create your own personal stops to make the experience your own. One of the best ways to experience some of Mallorca's dramatic scenery is this train ride across the island that allows you to see the rugged interior. From the port, a short motor coach ride will take you to the train station. You will board the old fashioned electric train for Soller. Learn all about this old fashioned electric train that has preserved its traditional character for almost 100 years. You will be passing almond and locust-bean trees, groves of olive trees and the lush and pine covered mountains. Arrive in Soller and take a walking tour around this charming village with free time before returning to your ship. Please note: Train ride will be one way and could be either going to Soller or coming back, depending on train schedules. The other way will be by motor coach. You should always take your ID and bring a camera and cash for shopping, sun protection and sunglasses. A short motor coach drive past olive trees and local vegetation brings you to the quaint 14th century village of Valldemossa, located at the foot of the Northern Mountain Range. Its former royal residence, La Cartuja, is the first stop on your tour. The residence became a Carthusian monastery in the Middle Ages and your guide will show you the chapel, a pharmacy, and the monks’ library. Valldemossa’s shining moment was in 1838, when George Sand and Frederic Chopin came to live at the monastery. Their stay here is well documented and a collection of their furniture remains. George Sand later wrote a book about their time here, entitled “A Winter in Majorca.” During free time, you will have the perfect opportunity to taste the typical sweets from Valldemosa called Coca de Patata, an individual sweet cake made with potatoes. The drive back to the ship will give you the opportunity to view the impressive cliffs to the north. Please note: Comfortable shoes with rubber soles are recommended. Spanish law requires motor coach passengers to wear their seatbelts in vehicles that are so equipped. Please, note that this tour is not available on Sunday.